This is what we did last year for April Fools and my kids LOVED IT!! Or was it dessert? Of course it was dessert because on April Fools you have to do things a little backwards. Then everyone had to pick a number and then received a sack with that number on it. Inside were their eating utensils for dinner...click here to see more from my family blog last year. It is a Super fun tradition for the fam! That is awesome. 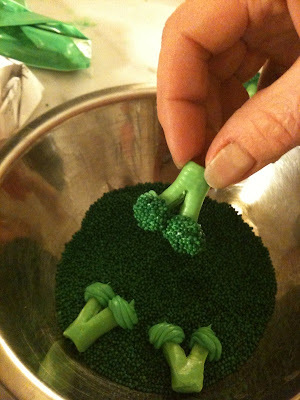 I think my daugther would expect that kind of broccoli every time we have dinner after that. I love the broccoli idea! My daughter will love to have some!